Where go to Snorkeling in Riviera Maya? Located on the eastern Yucatan Peninsula, covering the area between Tulum and Punta Brava, travelers will find Riviera Maya (Mayan Riviera). This Riviera covers an area of around 70 miles of beautiful coastline that follows the incredible Caribbean Sea. Today, Riviera Maya is a world-renowned holiday destination known for its history, culture, and natural wonders. Although there are so many things that people can see in the interior of this area, most of them focus on the coastline and the water. The truth is that the Caribbean Sea is one of the most beautiful seas in the world especially for those who want to practice water sports like diving, surfing, parasailing and of course the best snorkeling tour in playa del carmen. What is the best Riviera Maya Snorkeling experience? Without any doubt, Riviera Maya is a place that deserves to be visited by every tourist, but when it comes to snorkeling, this is not the right place. We can all agree that there are no right snorkeling spots in the riviera maya. If you practice diving or snorkeling, you will get a chance to see only Cenotes. These cenotes represent Mayan sinkholes where you can’t expect to find fish or anything else worth seeing. You can spot some fish in this area, but it will take a long time to do this. If you are still interested in snorkeling while you are in Riviera Maya, then you should take the ferry and visit Cozumel Island, a place where you can enjoy snorkeling to the maximum. Why so many Riviera Maya visitors prefer to go Snorkeling to Cozumel? To save you time and energy (and possibly some money), we will provide one valuable suggestion – take a Cozumel snorkeling excursion from playa del carmen. Cozumel island is in one of the most beautiful parts of the Caribbean Sea, just 30-40 miles from Riviera Maya. You will get there after a short ride, and you can start an unforgettable snorkeling adventure right away. The waters around Cozumel are shallow and suitable for complete beginners. Snorkeling in this area is attractive because the waters are crystal clear and many animals live there. At the same time, this is a safe activity which means that you cannot get in trouble if you are following your instructor’s guidance. It’s tough to tell which the best places for snorkeling in Cozumel are, but most of them are in the west part of the island. Some of the most visited places by snorkelers include paradise reef, El Cielo, Cozumel Palace, Fiesta Americana, and Chankanaab National Park. 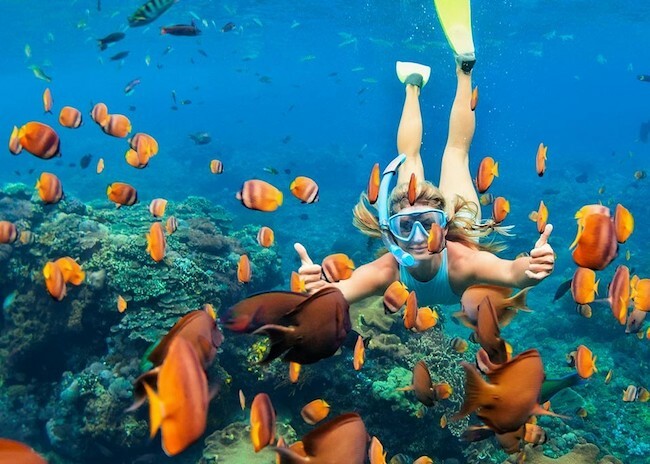 All these snorkeling sites are suitable for any snorkeler – beginner or expert snorkeler. The corals around this island are amazing, and you can find many fish and other marine creatures living there like a grunt, angelfish, snapper, anemones, toadfish, sergeant major, garden eel, lionfish, hermit crab, green sea turtle, and green moray eel. And ff you are interested in snorkeling in Riviera Maya, your best option is to take an excursion to Cozumel Island.